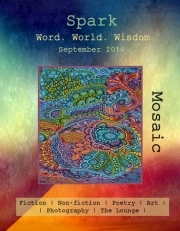 Description of "Spark - September 2014 Issue"
As temperatures cool and the season of festivities begins, Spark is delighted to present to you our 'Mosaic' edition! In this exciting potpourri, you will find some wonderful poetry and fiction, some beautiful art and photography, and non-fiction. We hope you enjoy the issue! Reviews of "Spark - September 2014 Issue"